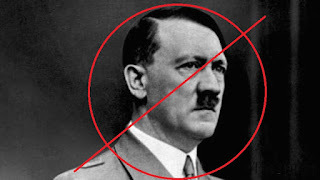 Let me be clear: I hate Hitler and everything he promoted and represented. If he is not the most purely evil and destructive person in world history I don't know who would have him beat but the list would be very short. He has been properly demonized as the primary antagonist of WWII and is responsible for the death of literally millions of people - some estimates place the number close to 100 million while more conservative numbers are in the 50 million range (when combining total military and civilians dead and those murdered in connection with the Holocaust). Think back now. What was Hitler's weapon? I have done some research and have watched countless documentaries on WWII but have never heard mention of him directly murdering anyone. Even while serving in WWI he was a dispatch runner and served the majority of the war well behind the front lines. A gun was not his weapon. His weapon was and remains to this day, the weapon responsible for the death of millions of people - Words. Through the influence of his speeches' and power of his pen millions perished. Here is where many libertarians might stumble. In retrospect it is easy to say that something should have been done to stop him. The Bavarian government should have silenced him, kept him from producing and distributing his pamphlets, refused to recognize his platform. They should have censored him. But what they can do to him they can do to you. To this very day copies of his book "Mein Kampf" are readily available for purchase almost everywhere in the world. In the U.S. you can walk into most large bookstores and purchase one off the shelves. Even now when the destructive nature of his words almost universally acknowledged they are still easily obtainable. Stores are free to sell them, publishers are free to produce them and individuals are free to purchase them. Why? Because the same Right that protects "Mein Kampf," protects Longfellow. The Right protecting his anti-Semitic rants, protects the calm words of Steinbeck. The same Right that protects the Quran for Muslin extremists to read protects it for peace loving followers of Islam to read. Some might even say "but Mein Kampf is so obviously evil" - to who? Who gets to decide that? Who can decide that? That is something we need to remember as we talk about gun laws, especially in the wake of the worst mass shooting in U.S. history. Why? Because the same Right that protects Omar Mateen protects millions of law abiding U.S. gun owners. Does having that belief mean I don't care? - of course not, nothing could be further from the truth. I am simply consistent in my beliefs. Just like I believe I don't have the Right to stop someone's words I believe I don't have the Right to stop what someone owns - be that a book or a firearm. Again the reply is "but something so obviously created to destroy..." but - 'obvious' to whom? I believe that I could make a compelling argument to support the same conclusion about words. Think about the total loss of life either directly or indirectly linked to words. The quantity is overwhelming. From atrocities in recent memory done by Muslim extremists to the words of Karl Marxx and The Bible (Spanish Inquisition, Crusades). While I have not done any real calculations I believe there would be a similar percentage of writing that has been used to kill as firearms that have been used to kill. There are literally hundreds of millions of firearms in the U.S. and hundreds of millions of rounds of ammunition are manufactured each year; only an indescribably small portion will ever be used to commit a crime. The vast-vast majority of firearms and ammunition are used peacefully - with many being used to practice and train for self-defense and to train law enforcement and military. Many are used for shooting sports and competitions. We need to inspire people to believe that we can and do live in a better world, one where killing people is not okay. That we live in a world where the Rights of a Muslim, an author, a publisher, a blogger are protected just like the Rights of a firearms owner. Stripping the Rights of a gun owner only sends the message that Rights are fleeting that, if the voice is loud enough other Rights can be disposed of as well. I'm honestly sad about the tragedy in Orlando. Over the weekend there was a terrible loss of life. I'm sad that instead of honoring the victims and talking about the legacy they left, instead of embracing our humanity and mourning we are forced to talk about gun rights. 50 people lost their lives and instead of talking about what a horrible thing that is we are instead talking about how to punish law abiding citizens.